How is a Certified Tax Coach different than a local CPA, Enrolled Agent, or Certified Financial Planner? CPA and EA are valuable marks. However, they can indicate a variety of specialties and only indicate what they are, not how they benefit you. Certified Tax Coaches are a leading group of tax professionals who are specially trained in the art of long-term, proactive tax planning. In addition to their standard certifications and tax degrees, Certified Tax Coaches are required to complete comprehensive education focusing on high-impact tax planning strategies. Certified Tax Coaches are also required to adhere to the American Institute of Certified Tax Coaches (AICTC) Code of Ethics which provides assurance that the strategies and ideas used to create your plan stay within the boundaries of the law. The AICTC upholds a strict Code of Ethics to ensure the highest standards of integrity and excellence among its members. After creating a Proactive Tax Strategy, what else will my Certified Tax Coach do for me? The best results come from building strong relationships with your Certified Tax Coach so that you benefit from their years of training and experience. When you work with a Certified Tax Coach, you aren’t just getting a tax return at the end of the year. A CTC offers a complete tax maintenance program. Tax maintenance programs are designed to give you ready access to a Certified Tax Coach. We’re there for you when you need us! This enables you to experience the least amount of tax liability each year and continually evaluate your situation as you work your way toward achieving your goals. Our programs were created to provide consistent, regular coaching to help you set goals and create a plan to achieve them. You have a trusted business advisor to answer any financial questions that may come up. Best of all, we highlight areas in which you are doing well and those that need improvement. You will receive the accountability you need to see your dreams come true! 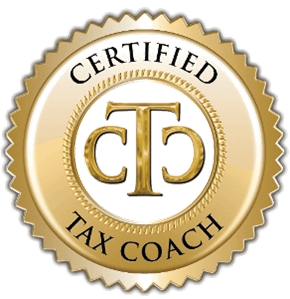 Why should I choose Certified Tax Coach to assist me with my taxes and financial planning? Are you one of the millions of American taxpayers overpaying the IRS and overlooking deductions year after year? 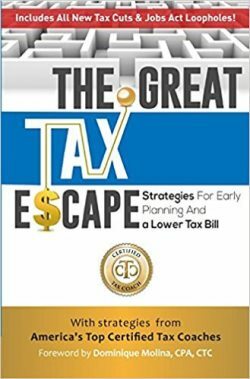 Certified Tax Coach’s tax professionals scour the tax code and thoroughly examine each customer’s income and business options to rescue every deduction, tax advantage, and credit possible. Certified Tax Coach emphasizes year-round proactive planning to ensure that clients can utilize every available loophole and savings opportunity possible.